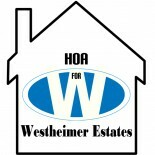 Welcome to the Westheimer Estates Homeowners Association website. We hope to use this site to increase the communication between Westheimer Estates homeowners and HOA board members. We also hope that site encourage participation of each homeowner in community activities by sharing your ideas, comments and concerns and also physically showing up to general meetings and activities. The purpose of the Westheimer Homeowners Association is to enhance and protect the value, attractiveness, and desirability of the lots and homes constituting Westheimer Estates Subdivision, so that all of the subdivision shall be benefited and each successive owner of any lot in Westheimer Estates shall be benefited by the preservation of the value and character of these lands. A homeowner association is a corporation formed by a real estate developer for the purpose of marketing, managing, and selling of homes and lots in a residential subdivision. It grants the developer privileged voting rights in governing the association, while allowing the developer to exit financial and legal responsibility of the organization, typically by transferring ownership of the association to the homeowners after selling off a predetermined number of lots. It allows a civil municipality to increase its tax base, but without requiring it to provide equal services to all of its citizens. Membership in the homeowners association by a residential buyer is typically a condition of purchase; a buyer isn’t given an option to reject it. Most homeowner associations are incorporated, and are subject to state statutes that govern non-profit corporations and homeowner associations. State oversight of homeowner associations is minimal, and mainly takes the form of laws which are inconsistent from state to state. This is why we believe that people should play a part in making the decisions which affect them and become active participants of the Westheimer Estates Homeowners Association. Please click on the Latest Post page to get the latest article shared on this site.